We ar e a Church of England church with a catholic flavour. We are growing and learning about liturgy and music and open to the movement of the Holy Spirit. Our main Sunday worship is our Sung Eucharist which is quite traditional, with organ accompanied hymns. 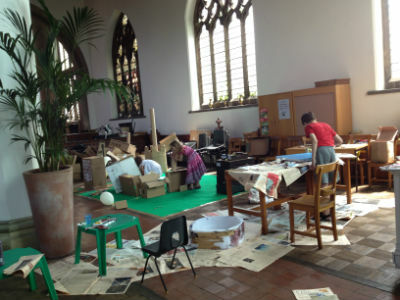 We are blessed with a great space and make it available for all kinds of other activities which often form part of our worship - this picture is of a cardboard city built by children on a Narcotics Anonymous fun day - this was a focus of prayer during the following week. You will find a warm welcome at the door and an openness in our worship. After the Sunday morning service we have coffee and cake when you can meet others and make new friends. 10am Sung Eucharist - Sunday School takes place during term time.